Nicaragua is one of the least developed and poorest countries in Latin America, second only to Haiti, with more than 42 percent of its residents living in poverty, according to the World Bank. Poverty, although declining steadily in recent years, remains high. More than 80 percent of Nicaragua’s poor live in remote rural communities where access to basic services is a daily challenge. After decades of political instability and vulnerability to natural hazards, the country has achieved a remarkable economic turnaround and is now focusing on innovative ways of reducing poverty. The Mary Help of Christians Elementary School provides pre-kindergarten through grade 8 education for poor youth. 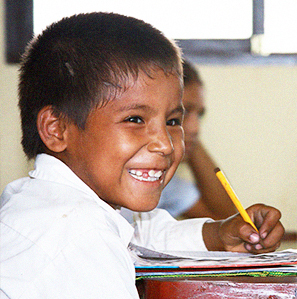 Salesian missionaries also operate elementary and high schools in communities in Nicaragua. Education has proven to be an effective means of breaking the cycle of poverty while giving the most vulnerable youth a sense of personal dignity and self-worth. Youth and the elderly in Salesian programs in Managua, the capital and largest city in Nicaragua, have access to better nutrition thanks to an ongoing partnership between Salesian Missions and Feed My Starving Children, a nonprofit Christian organization committed to, “feeding God’s children hungry in body and spirit.” The partnership has resulted in a rice-meal donation that has reached more than 500 beneficiaries in Managua including students at a Salesian-run primary and secondary school, girls at a Salesian boarding school and elderly members of a Salesian church congregation. Every Monday, more than 80 low-income, mostly elderly people between the ages of 80 and 95 visit a Salesian church in Managua and are provided food and other assistance from the church community. 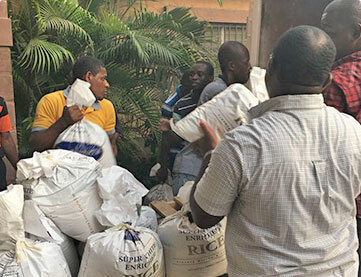 Salesian missionaries in the community have noticed that since the rice-meal donation, the recipients’ strength and health, as well as their mood, have improved. Salesian sisters who operate a boarding school for girls just outside the city also received part of the donation and provided the meals to their boarders who take classes in baking, sewing and embroidery in addition to academic courses toward a high school diploma. The added nourishment has had a significant impact on the girls’ ability to concentrate on their studies. The primary recipients of the rice-meal donation were two Salesian schools in Managua, a kindergarten for young students ages 3 to 5 and a Salesian high school. Between the two schools, more than 200 students received better nutrition as a result of the donation. The rice-meals were provided to students during the school day as part of a free lunch program to ensure they receive proper nutrition and a balanced diet, helping them to focus on their studies and extracurricular activities. Salesian missionaries began the school feeding program to meet the needs of the many area families with limited resources to feed their children. Mary Help of Christians Elementary, a Salesian-run school in Granada, has new school and office furniture thanks to a recent donation made possible by a partnership between Salesian Missions and GRRO International, an organization focused on supporting surplus property distribution and commodity recycling. 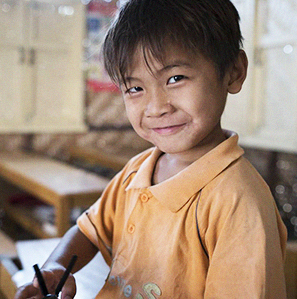 The Mary Help of Christians Elementary School provides pre-kindergarten through grade 8 education for poor youth. Close to 500 elementary school students and their teachers benefited from a donation of three 40-foot containers of new furniture. The new furniture will be used in classrooms, in administrative offices and at the school’s feeding program. Education has proven to be an effective means of breaking the cycle of poverty while giving the most vulnerable youth a sense of personal dignity and self-worth. Elementary and secondary education lays the foundation for early learning. The donated desks and chairs help provide a more dignified and organized educational environment for students to complete their studies. As a result, students are often more focused on their classroom work and more prepared for their lessons. In February 2016, 23 students from Don Bosco Preparatory High School in Ramsey, N.J. and 12 chaperones went on the school’s annual mission trip to Masaya, the capital city of the Masaya department. Each year over the school’s winter break, students accompanied by teachers, parents and other chaperons head to the Mama Margarita Foundation in Masaya to help with community development and enrichment projects facilitated by the foundation. The Mama Margarita Foundation was started by the parents of Salesian Father Manny Gallo, who once worked at Don Bosco Prep but is currently with Don Bosco Cristo Rey High School in Takoma Park, Md. The Foundation was started to help families living in poverty in the city of Masaya. On this mission trip, Don Bosco Prep students built a home for a poor family in the community. This was the third completed house built by Don Bosco students. The group also worked on various other projects with the Mama Margarita Foundation. Dr. Luis Rodriguez, a dentist and friend of Fr. Gallo, joined the mission trip and worked with a local dentist to examine and treat 176 children in five days. Students brought donated items like clothing, toys and dental supplies, such as toothbrushes, floss and toothpaste for the children.